Graduation card messages are meaningful ways for you to convey your thoughts to the graduate. 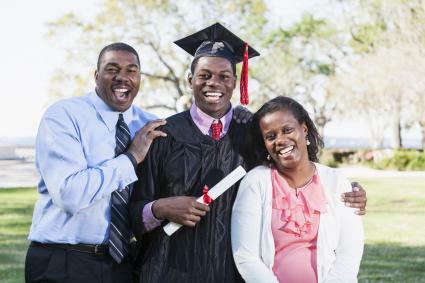 Parents, relatives and friends can write cards that positively impact the graduating teen. If you're at a loss for words, it's helpful to have some guidance on what to put in the card. Like yearbook quotations, graduation card messages can be happy, funny, honest, and inspirational. There are numerous types of messages that can be put in a graduation card that show the graduate how much you care about them. They say that the future is only what you make of it. I'm confident you'll use all of your skills to make yours great. Congratulations on making it this far! I look forward to seeing how much farther you make it in the future! I'm still waiting for the other shoe to drop - we can't actually be graduating! Growing up with you was an experience. I'm so glad to have the experience of graduating now with you too! I never thought this day would happen. I still remember trading lunches on the playground and now we have diplomas. Thanks for everything over the years and congrats! You've been an incredible friend throughout the years and I am so excited to celebrate your graduation with you. I can't believe you are graduating. No, really - I can't. Congrats - I never thought it would happen! Wait, you graduated? How did that happen! All the best to you! If I had a penny for all the times I thought you'd get this far... well, I'd be quite poor. Congrats! I can't believe you're officially turning into a real grown up! Now that you've graduated it's time to embrace your specialty... partying! We are so excited to celebrate your accomplishments today and look forward to seeing what your future holds. We share in your happiness on this very special day. We are so thrilled for you! You've accomplished so much and I am so pleased to celebrate your successes with you. Your graduation deserves to be celebrated! We are so happy to do so with you! I'm so glad to be here with you today celebrating your graduation! We could not feel happier watching you walk down the aisle to graduate. We are so impressed by your accomplishments. We hope you always cherish this special day. Congratulations to an amazing person! Today is your day! We look forward to celebrating your graduation with you! This is a day you will always remember and we hope you look back upon it fondly. You are a wonderful person and we hope your graduation is a special moment for you. You are about to embark on an incredible journey of self-discovery. Enjoy this amazing day and get ready for an exciting future. Savor this sweet memory. We are so touched that we get to be here with you on your graduation day. Don't let the fear of the future keep you from making it the present. Thank you for including us today. Congrats on graduating! Happy graduation day to a lovely person! We can't wait to celebrate your graduation with you! Congrats to you for making it to this special day! We wish you the very best on your graduation day! May your dreams become as real your every day, your fears become as far away as the moon and your life to stay as bright as the sun. This day came so quickly. We are so very proud of you and what you have accomplished. We love you so much! Breathe in every moment of this incredible day. Congratulations on this special accomplishment. Watching you graduate today is one of the happiest moments of our life. We are so proud of the person you have become. Cheers to a momentous occasion. We are honored to watch you graduate today. We are truly honored to be your parents. You impress us every day with your kindness, strength, and determination. Congratulations on graduating today. We could not feel more proud of you. We love you. Your time in high school was well spent. I hope the rest of your years have as much success. You are the best sister in the entire world and I am so excited to celebrate your graduation with you today! Graduating is a wonderful accomplishment for a wonderful sister! I love you so much! I hit the jackpot when it comes to siblings. So happy to be here celebrating your graduation with you! You have inspired me to be the best version of myself and for that I thank you. I know you will continue to make me proud to be your sibling as you embark on to the next phase of your life. I can't wait to see what your future has in store for you. You are truly an amazing person. Congrats on this momentous day! I remember that time we sat on the swings and thought we were infinite. I hope the rest of your life feels like that! Your high school accomplishments are something to be very proud of. I am truly inspired by you and know that I will continue to be as you enter into this next chapter of your life. Congrats on graduating today. I feel so blessed to be here celebrating your high school career with you. Knowing I have you as a brother makes me feel so beyond lucky. I hope you feel extra special today as we all support your incredible accomplishments! I hope I can be there for you as much as you've been there for me. You really are the best brother I could have asked for. Today we celebrate this epic milestone and party! I am over the moon happy for you today and can't wait to follow in your footsteps. You're the best and I love you so much! Take your time when it comes to writing a graduation card for your friend or loved one. It can be very meaningful for the graduate to receive a thoughtful, sweet card to commemorate their accomplishments.